"After decades of decline, the rust-belt city- with its forgotten landmarks - has become a hip destination for those in the know"
Forgotten Buffalo, the region's authority on unique landmarks, classic taverns, old world neighborhoods and "Nickel City" oddities presents Buffalo's original "Off the Beaten Track" tours. Much more than your average historical tour, these are interactive adventures. Forgotten Buffalo Tours allow "urban explorers" to eat, drink and laugh their way through local history! Led by media personality Eddy Dobosiewicz and trained Buffalo architecture and history docent* Marty Biniasz, each tour will give you a sense why Buffalo-Niagara is one of the most unique urban communities in the world. * Biniasz is a graduate of the University of Buffalo's School of Architecture and Planning's docent training program and is a former tour guide of Roam Buffalo. He also served as a Board of Director member of the Friend's of the UB School of A&P. * Television personality and Buffalo native Eddy Dobosiewicz has become one of the areas biggest promoters. He is a lifelong area resident, community activist and preservationist involved in numerous community, civic and cultural organizations and executive boards. Friendly & fun, quirky & quaint, nostalgic & new.... ForgottenBuffalo Tours take you places that locals love. On our tours, you'll get to know the character.... and characters... that make us proud to call Buffalo home! Buffalo Wings, Beef on Weck, Tavern Style Fish Fries, Family Cooked Ethnic Meals....Forgotten Buffalo Tours include some the finest culinary treats in Western New York. Experience Buffalo foods in authentic Buffalo settings...corner taverns, former clubs and "off the beaten path" restaurants. A meal during a Forgotten Buffalo Tour is part of the adventure. Eat, Drink and Laugh Buffalo History! Due to limited space, tours are subject to sell out without notice. Confirmed reservations are recommended. E-mail ForgottenBuffalo@aol.com or call 716-833-5211 for reservation details and availability. Except where otherwise noted, current tours cost $55 per person. Do not send payment without making a reservation. Price includes meal, bus transportation, docent led guided tour. prizes and giveaways. Must be 21 years of age to participate. E-mail or phone reservations will be held for 48 hours only. Cancellations or changes less than 3 business days prior to tour will be subject to a non refundable deposit of $30 per person. No shows or cancellations less than 24 hours prior to tour will forfeit any refund or credit. Payment in full must be received no later than 4 business days prior to the requested tour date and can be made with check or money order. Returned checks will be subject to a $35 fee. NOTE: Please download, complete and include with your payment our tour order form found below. Private Tours require a minimum of 40 people, although we can accommodate 44 (larger groups subject to additional charge). A non refundable $500.00 deposit will secure the date (subject to availability). Balance and final headcount due 5 business days prior to event. For date availablity and details, call 716-833-5211. If you�re a lifelong Buffalonian or a new arrival to the city, Forgotten Buffalo Tours can get you acquainted with the one-of-a-kind, fun, and friendly places that make our city special. Hosting a visit with friends and family? Our Forgotten Buffalo Tours make it easy to plan activities for guests. Planning a wedding? Contact Forgotten Buffalo Tours for customized outings for your out-of-town guests. Researching your family history or planning a family reunion? Our tours take you to the historic places where Buffalo got its start. Explore the neighborhoods and discover your family�s roots. Looking for something new to do? Break out of your rut and discover your new favorite restaurant, tavern, or historic site art gallery, theatre, or shopping excursion. Our neighborhood itineraries will take you there. Are you a member of the Travel Media? Looking for stories of urban adventures? Forgotten Buffalo can help you uncover novel story ideas and assist in your Buffalo neighborhood trip planning. Contact Forgotten Buffalo at ForgottenBuffalo@aol.com. 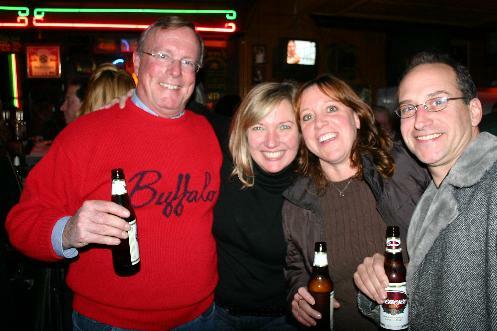 CLICK IMAGE ABOVE TO SEE PICTURES FROM PAST FORGOTTEN BUFFALO TOURS: Eat, Drink, and Laugh through Buffalo History! Don't miss the next Forgotten Buffalo Tour!